I went back home for a quick visit a few weeks ago and wanting to make some treats for my friends, I turned to my trusted Chewy Gooey Crispy Crunchy Melt-in-Your-Mouth Cookies by Alice Medrich. This cookbook never ceases to amaze me at how incredible the recipes turn out. Every recipe I've made from the book has turned out perfect and absolutely delicious. Alice is a baking genius. 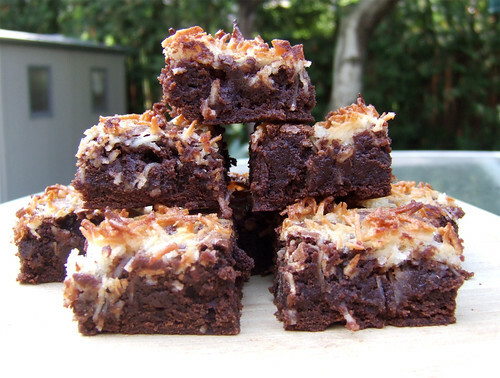 As I was flipping through the book, I came across Alice's recipe for Lacy Coconut-Topped Brownies and knew this was the next recipe I had to try. 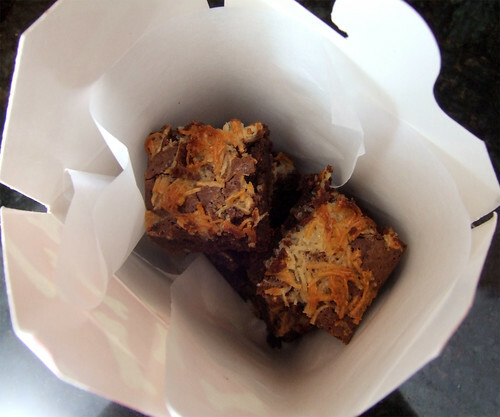 Coconut and chocolate is such a fantastic combination, I couldn't resist! The chocolate brownie base is topped off with a chocolate macaroon topping that's scattered over top to create the "lacy" effect. Oh. My. God. These brownies certainly did not disappoint in the least. I managed to save the corner pieces for myself. 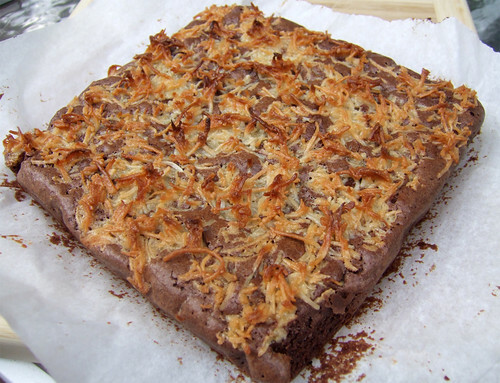 Super chocolatey and fudgey with a layer of crunchy toasted coconut on top. Yet another successful recipe from Alice. I'll definitely be making these again!